This is a mini of glossaries on satellite tv. I bet, this will be a handy reference for all beginners who wish to learn more about satellite tv. Satellite TV Scope, mode of operations as well as differences between satellite tv and broadcast tv among others is what we are discussing today. You will also be introduced to the equipment needed to receive satellite tv channels. What is Satellite Tv and how does it differ from broadcast and cable tv? Satellite TV Encoding and Encryption? Historically, the first satellite tv hit the market in the early 1990s. Then everything was huge, heavy and expensive. Only the rich or die-hard television fans could afford it. Apart from the huge capital outlay involved in buying the necessary equipment, you also have to go through the hassle of setting it up. Back in the day, satellite tv is harder to get than cable tv or broadcast tv. Nowadays, broadcast tv is phasing out while you can see a satellite dish on the rooftops of virtually every home in urban areas. Though satellite TV technology is still evolving, it has already become a popular choice for many television viewers. In the nearest future, Satellite Tv would be less popular as Internet TV(IPTV) is already gaining global popularity and acceptance. First, a satellite TV is a lot like a broadcast TV conceptually. It’s a wireless system for delivering television programming directly to a viewer’s house. Both broadcast television and satellite stations transmit programming via a radio signal wave. NOTE: Early satellite TV viewers who used C-band radio for their broadcasts were able to catch wild feeds of syndicated programs, sporting events and news. These broadcasts were free, but viewers had to hunt them down — they didn’t get previewed or listed like regular broadcast programming. These signals still exist, and Satellite Orbit magazine publishes a list of today’s wild feeds. Broadcast stations, on the other hand, use a powerful antenna to transmit radio waves to the surrounding area. As a result, viewers can pick up the signal with a much smaller internal or external antenna. The main limitation of broadcast TV is the range. The radio signals used to broadcast television shoot out from the broadcast antenna in a straight line. In order to receive these signals, you have to be in the direct line of sight of the antenna. Small obstacles like trees or small buildings aren’t a problem; but a big obstacle, such as the Earth, will reflect these radio waves. Now the earth is not flat. If the earth were to be flat, you would have been able to pick a signal of one country in another. But, the earth is curved or let me say spherical. Therefore, basic obstacles interfere with the signals and this eventually breaks the signal’s line of sight This constitutes the first problem of a broadcast TV. The second distinction between satellite Tv and broadcast Tv is the problem of signal distortion associated with a broadcast. Even for those close to the source, you can still notice some waves, noise or audio failure while enjoying your channels. Early satellite TV viewers used their expensive dishes to discover unique TV contents that weren’t necessarily intended for mass audiences. The dish and receiving equipment gave viewers the tools to pick up foreign stations live feeds between different broadcast stations and a lot of other stuff transmitted using satellites. Today, most satellite TV customers get their programming through a direct broadcast satellite (DBS) provider. Examples of such Satellite providers includes beIN, Sky, DirecTV or DISH Network. These providers select programs and broadcast them to subscribers as a set package(examples of these are DSTV, Canal, bein, skytv, fox and so on). Basically, the provider’s goal is to bring hundreds of channels to your TV in a form that approximates the competition, cable TV. Unlike earlier programming, the provider’s broadcast is completely digital, which means it has a much better picture and sound quality. Early satellite television was broadcast in C-band radio — radio in the 3.7-gigahertz (GHz) to 6.4-GHz frequency range. Digital broadcast satellite transmits programming in the Ku frequency range (11.7 GHz to 14.5 GHz ). 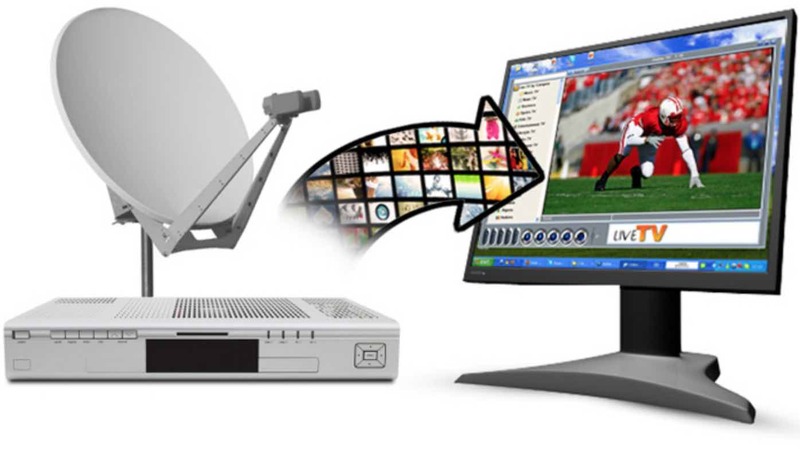 There are five major components involved in a direct to home (DTH) or direct broadcasting (DBS) satellite TV system: the programming source, the broadcast center, the satellite, the satellite dish and the receiver. Programming sources are simply the channels that provide programming for broadcast. The provider doesn’t create original programming itself; it pays other companies (HBO, for example, or ESPNr SKY) for the right to broadcast their content via satellite. In this way, the provider is kind of like a broker between you and the actual programming sources. Satellite disadvantages: It is expensive to purchase all the equipment at the outset (and you can’t typically rent it). If you want to access satellite TV in multiple rooms, be prepared for extra fees. Also, satellite TV is subject to weather-related malfunctions. As you should expect, is a very long process involved before satellite tv channels appear on your TV screen in the form of your favorite TV show. 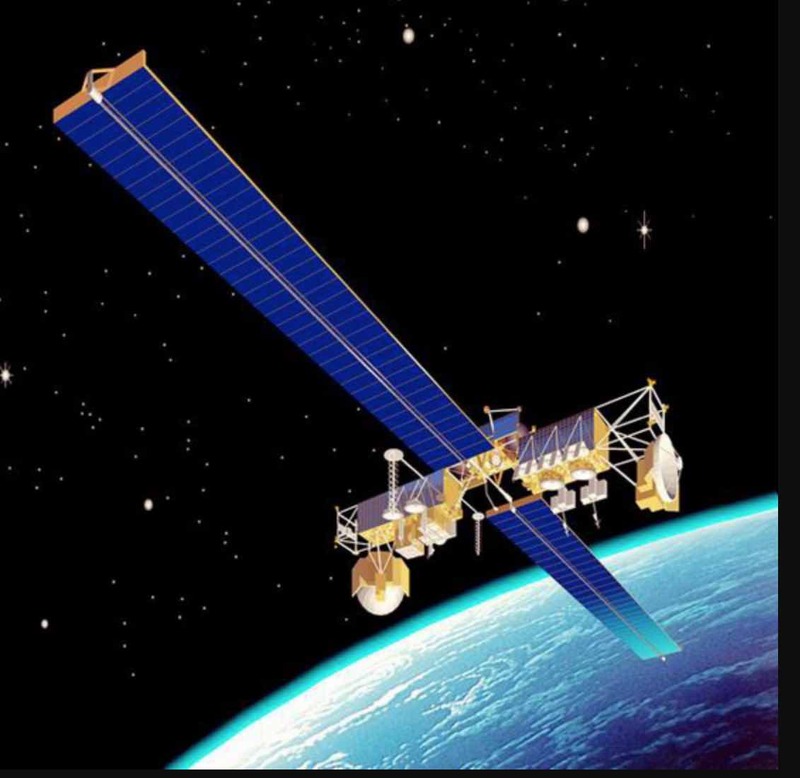 The reason is that satellite signals contain such high-quality digital data, it would be impossible to transmit them without compression. Compression simply means that unnecessary or repetitive information is removed from the signal before it is transmitted. The signal is reconstructed after transmission. Satellite TV uses a special type of video file compression standardized by the Moving Picture Experts Group (MPEG). With MPEG compression, the provider is able to transmit significantly more channels. Also, there are currently five of these MPEG standards, each serving a different purpose. DirecTV and DISH Network, the two major satellite TV providers once used MPEG-2, which is still used to store movies on DVDs and for digital cable television (DTV). With MPEG-2, the TV provider can reduce the 270-Mbps stream to about 5 or 10 Mbps (depending on the type of programming). Now, DirecTV and DISH Network use MPEG-4 compression. Because MPEG-4 was originally designed for streaming video in small-screen media like computers, it can encode more efficiently and provide a greater bandwidth than MPEG-2. Meanwhile, MPEG-2 remains the official standard for digital TV compression. MPEG-4 can produce a better picture of dynamic images through the use of spatial (space) and temporal (time) compression. This is why satellite TV using MPEG-4 compression provides a high definition of quickly-moving objects that constantly change place and direction on the screen, like in a basketball or soccer game. This is the most technical and most frustrating aspect. Hackers have tough time hacking encrypted channels while we consumers wish every receivable channel is free to air. At the broadcast center, the high-quality digital stream of video goes through an MPEG encoder, which converts the programming to MPEG-4 video of the correct size and format for the satellite receiver in your house. Firstly, it can work as an intraframe, which contains the complete image data for that frame. This method provides the least compression. As a predicted frame, which contains just enough information to tell the satellite receiver how to display the frame based on the most recently displayed intraframe or predicted frame. A predicted frame contains only data that explains how the picture has changed from the previous frame. Lastly, the encoding can take the form of a bidirectional frame, which displays information from the surrounding intraframe or predicted frames. Using data from the closest surrounding frames, the receiver interpolates the position and color of each pixel. This process occasionally produces artifacts – glitches in the video image. One artifact is macroblocking, in which the fluid picture temporarily dissolves into blocks. Macroblocking is often mistakenly called pixilating, a technically incorrect term which has been accepted as slang for this annoying artifact. Graphic artists and video editors use “pixilating” more accurately to refer to the distortion of an image. There really are pixels on your TV screen, but they’re too small for your human eye to perceive them individually. Pixels are tiny squares of video data that make up the image you see. The rate of compression depends on the nature of the programming. for instance, If the encoder is converting a newscast, it can use a lot more predicted frames because most of the scene stays the same from one frame to the next. In more fast-paced programming, things change very quickly from one frame to the next, so the encoder has to create more intraframes. As a result, a newscast generally compresses to a smaller size than something like a car race. After the video is compressed, the provider encrypts it to keep people from accessing it for free. Encryption scrambles the digital data in such a way that it can only be decrypted (converted back into usable data) if the receiver has the correct decryption algorithm and security keys. Once the signal is compressed and encrypted, the broadcast centre beams it directly to one of its satellites. The satellite picks up the signal with an onboard dish, amplifies the signal and uses another dish to beam the signal back to Earth.It is when the signal gets to the Earth that viewers can pick it up. next, we’ll see what happens when the signal reaches a viewer’s house. 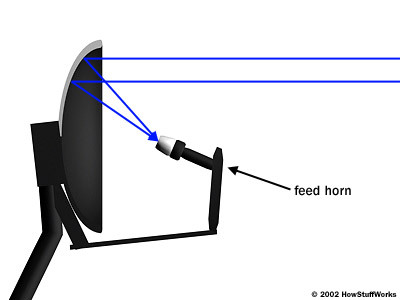 curved dish reflects energy from the feed horn, generating a narrow beam. curved dish focuses incoming radio waves onto the feed horn. First off, when the signal reaches the viewer’s house, it is captured by the satellite dish. A satellite dish is just a special kind of antenna designed to focus on a specific broadcast source. The standard dish consists of a parabolic (bowl-shaped) surface and a central feed horn. To transmit a signal, a controller sends it through the horn, and the dish focuses the signal into a relatively narrow beam. Additionally, the dish on the receiving end can’t transmit information; it can only receive it. The receiving dish works in the exact opposite way of the transmitter. When a beam hits the curved dish, the parabola shape reflects the radio signal inward onto a particular point, just like a concave mirror focuses light onto a particular point. In some systems, the dish needs to pick up signals from two or more satellites at the same time. The satellites may be close enough together that a regular dish with a single horn can pick up signals from both. This compromises quality somewhat because the dish isn’t aimed directly at one or more of the satellites. A new dish design uses two or more horns or LNBs to pick up different satellite signals. As the beams from different satellites hit the curved dish, they reflect at different angles so that one beam hits one of the horns and another beam hits a different horn. The central element in the feed horn is the low noise blockdown converter, or LNB. The LNB amplifies the radio signal bouncing off the dish and filters out the noise (radio signals not carrying programming). The LNB passes the amplified, filtered signal to the satellite receiver inside the viewer’s house. The end component in the entire satellite TV system is the digital satellite receiver/encoder/decoder. Technically, a decoder takes the digital MPEG-2 or MPEG-4 or HD signal and converts it into a format that a standard television can recognize. Furthermore, a receiver extracts the individual channels from the larger satellite signal. When you change the channel on the receiver, it sends just the signal for that channel to your TV. Since the receiver spits out only one channel at a time, you can’t tape one program and watch another. Also, you can’t watch two different programs on two TVs hooked up to the same receiver. In order to do these things, which are standard on conventional cable, you need to buy an additional receiver or get some other 3rd party components read more here. Receivers have a number of other features as well. They pick up a programming schedule (EPG)signal from the provider and present this information in an onscreen programming guide. Many receivers have parental lock-out options, and some have built-in digital video recorders (DVRs / PVRs), which let you pause live television or record it on a hard drive. If one study course; like ICT in the university, can it be of help in this field?. @owanemi: for position, please check my fta article. As for the tvc issue, am. Afraid I don’t have an answer for that other than the fact that the problem is from the source. Mr. Morgan please any news on multi tv cos its been off for sometime now.